As a child of children of the Great Depression, I come by my frugal DNA honestly. We weren’t poor growing up, but my parents watched their pennies and taught us to be grateful – and respectful – for what we did have. This explains why I have little tolerance for food waste, I’m religious about using up leftovers, and – every time I see someone carelessly toss food into their cart at the supermarket – I want to give them a piece of my mind. It also explains my fondness for this obscure pie whose main ingredient is something we typically discard without a second thought: watermelon rind. Aside from pickling it, watermelon rind doesn’t get a whole lot of respect, so it’s thrilled that you’re giving it some love. 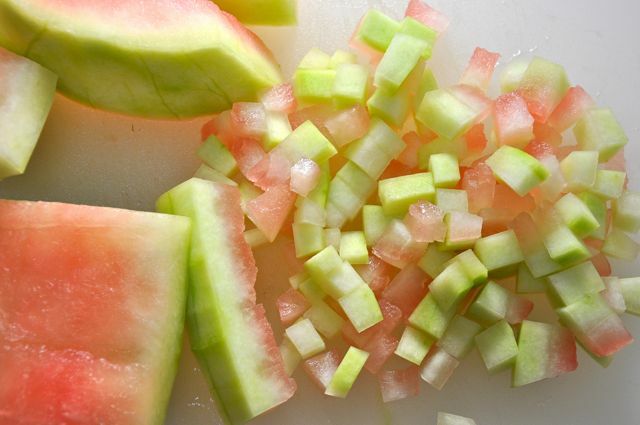 For our purposes, watermelon rind includes everything just under the dark green skin – which you’ve peeled and discarded – up to where the pink of the fruit begins, pretty much the stuff you see here. Leaving a little of the pink is good because it provides a bit of juiciness for the filling. Dice the rind nice and small, into 1/4- to 1/3-inch cubes. To render it edible, the rind is boiled in sugar water for about 20 to 25 minutes, until it’s tender and begins to look translucent. Then it’s drained, cooled, and mixed with sugar, dried fruit, chopped pecans, spices, and vinegar. 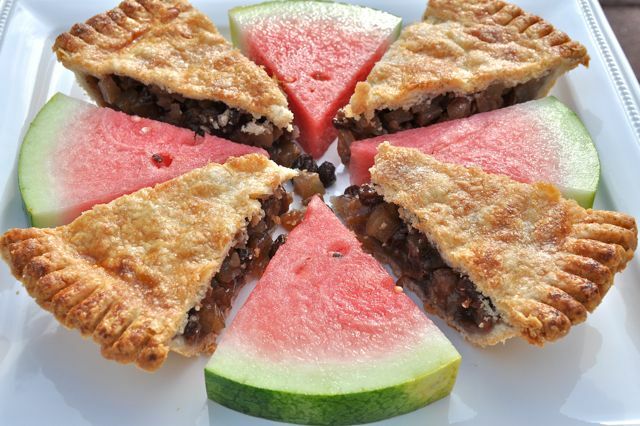 I hesitate to say that the filling tastes remarkably like mock mincemeat, lest you wait until the holidays to try this and watermelons are nowhere to be found, but it does. A dollop of whipped cream or scoop of vanilla ice cream is just the thing for smoothing out the sharp edge of the spices. Unlike so many of my pies that get baked in a deep-dish pie pan, I bake this in a standard 9- or 9 1/2-inch pan, one that’s about 1 1/4-inches high. 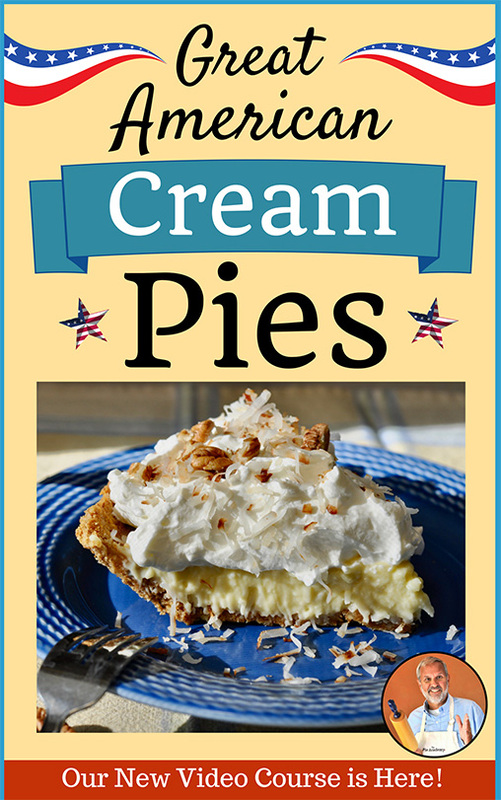 Some pies are just meant to be appreciated in smaller doses, and this is one of them. Use your favorite double crust pie dough recipe here. 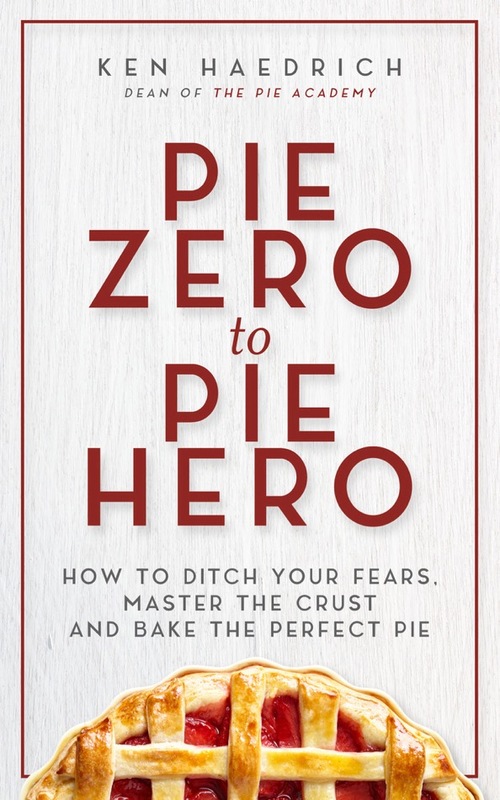 I used the buttery Slab Pie Dough, dividing it in half – one slightly larger than the other – and shaping it into 2 disks prior to refrigerating and rolling it. (The larger one is for the bottom crust.) Prior to baking, the top pastry is finished with an egg glaze and a dusting of sugar, giving it that lustrous golden brown veneer. 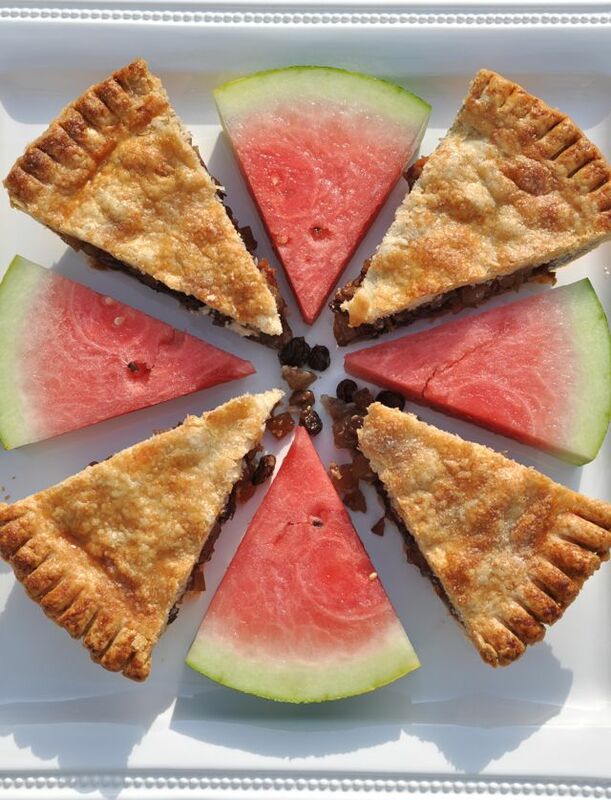 I think you’re going to like this watermelon rind pie, so I hope you’ll work it into your schedule. 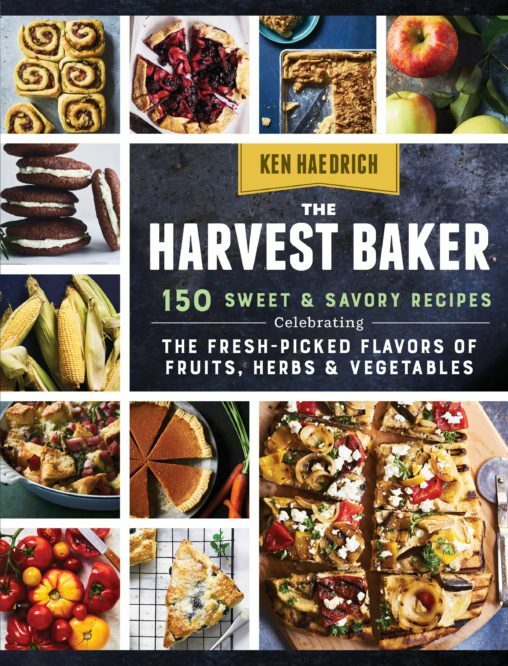 Squeeze it in there somewhere between the end-of-summer fruit pies and your first apple pies of the season. 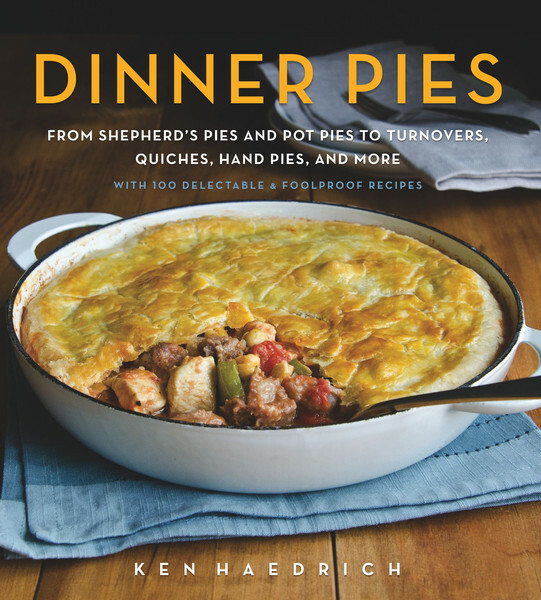 It’s something of a novelty pie, unexpected, and one you’ll enjoy making and sharing with friends and family. (I always make ’em try to guess what the secret ingredient is.) Let me know how you like it. In just a little more than six weeks, a dozen intrepid Pie Academy members will be descending on beautiful and historic Charleston, South Carolina for a one-of-a-kind weekend of pie making, sightseeing, and world class dining. It’s going to be fabulous, and you can read all about it here, and watch the video here. We know how distracting summer can be – all those vacations, poolside umbrella drinks, and that back-to-school shopping. And we understand if your fall plans have been on hold. But now that summer is winding down, it’s time to pull out your calendar and make plans to join us. There are just a couple of spots left, and we really want you to grab one of them. Come alone – you’ll make plenty of new friends. Or bring a friend, like a few of our attendees are doing, and share a weekend you’ll be talking about for years to come. If you have any questions or would like to receive a registration form, send an email to Bev – bev@ThePieAcademy.com – and she’ll get in touch. See you there. PASTRY NOTES: I like the buttery SLAB PIE DOUGH for this pie, but your favorite double crust pie dough will do just fine. If you haven't already, prepare the Slab Pie Dough. Divide it in half, one slightly larger than the other, and shape into 3/4-inch thick disks. Wrap in plastic wrap and refrigerate for at least 1 1/2 to 2 hours before rolling. Combine the watermelon rind and 1/4 cup of the sugar in a large saucepan. Add water to cover. Bring to a boil, partially cover, and continue to boil until the rind is tender and translucent, 22 to 25 minutes. Drain well, then transfer the rind to a large bowl and let cool. On a floured surface, roll the larger half of dough into a 12-inch circle. Line a standard - not deep-dish - 9- to 9 1/2-inch pie pan with it, gently tucking the pastry into the pan without stretching it. Let the edge drape over the sides of the pan. Refrigerate. Preheat the oven to 400°F. Stir the remaining 1/2 cup sugar into the cooled rind. Stir in the raisins, dates, nuts, vinegar, lemon juice, brown sugar, ginger, flour, spices, and salt. Set aside. Roll the other piece of dough into a 10- or 11-inch circle. Turn the filling into the chilled pie shell, smoothing the top with a spoon. Lightly moisten the edge of the shell with a pastry brush. Drape the top pastry over the filling, line up the edges, and press to seal. Using a sharp knife, trim the edge of the dough flush with the edge of the pan. Crimp with a fork all around. Poke the top pastry several times with a fork to make steam vents. Brush the pastry sparingly with the egg wash, and sprinkle with sugar. Bake the pie on the middle oven rack for 30 minutes, then rotate it 180°. Reduce the heat to 375°F, and bake another 25 to 30 minutes, until the top is a rich golden brown. 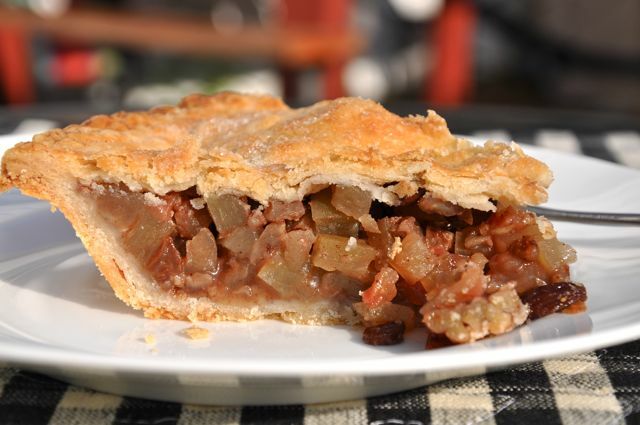 This is not an overly juicy pie, so you may or may not see juices bubbling up through the steam holes. Transfer to a rack and cool for at least 1 hour before slicing. Makes 8 to 10 servings.